An Offshore Grand Slam is becoming a common theme lately with the arrival of Yellowfin Tuna into one day range. Bluefin Tuna, Yellowfin Tuna, Dorado and Yellowtail equals an offshore slam! This becomes the goal of Sport boat Captain and private boater alike. Although just putting quality fish on the boat is the primary goal. Although lots of Tuna are in the more catchable range of 15 to 30 pounds, enough 40 to 50 pounders are being caught to settle jackpots. The long boat rides down into the 180 to 190 mile range became a less frequent quest with good fishing closer to port. As far as one day range goes, the counts are excellent for Yellowtail and Dorado. Even the ½ day boats are running offshore to join the ¾ day boats for Kelp Paddy fish, with mixed Tuna joining the counts. 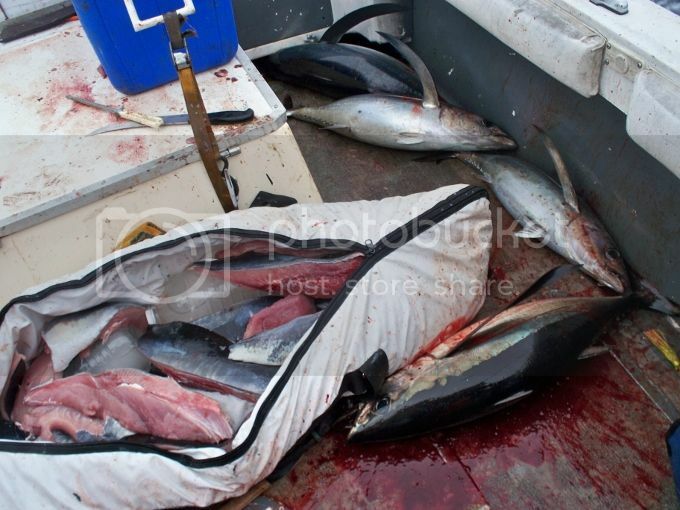 The ½ day boat Dolphin caught 22 Bluefin Tuna and 43 Yellowtail on their run yesterday, Friday, 09-13-13. 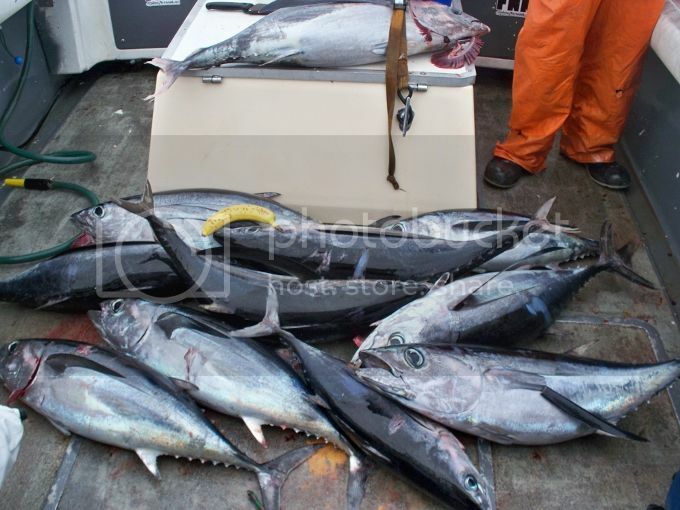 The ¾ day boats had Yellowtail counts approaching 200 during their runs offshore. There remains an abundance of Rat Yellowtail, with some bigger guys thrown in, and with better counts on Dorado and some Tuna. Unfortunately if you have not made a reservation to go this weekend, you are SOL as most all boats are again sold out again. There have been a number of recent trips to the Cortez Bank, which despite rough weather, have yielded some solid fishing on Yellowtail to 45 pounds, Bluefin Tuna in the 15 to 25 pound range and a surprise finding of White Seabass. 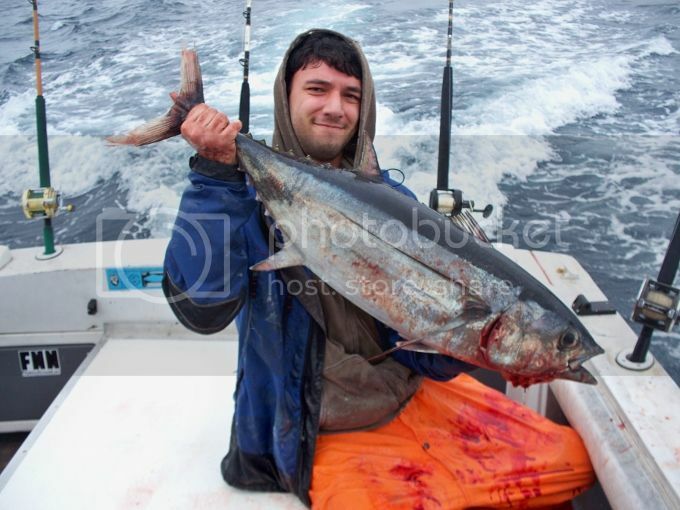 Huge Bonito are also being caught at the bank. 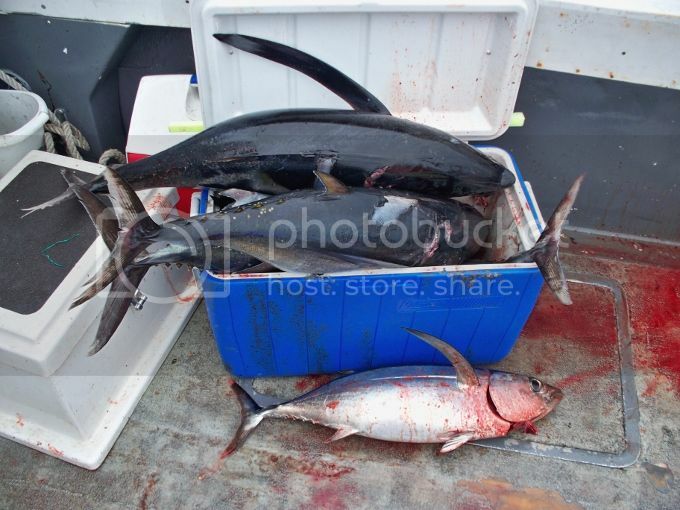 The nner Tanner Bank has also been yielding a good amount of Bluefin Tuna and big Yellowtail. 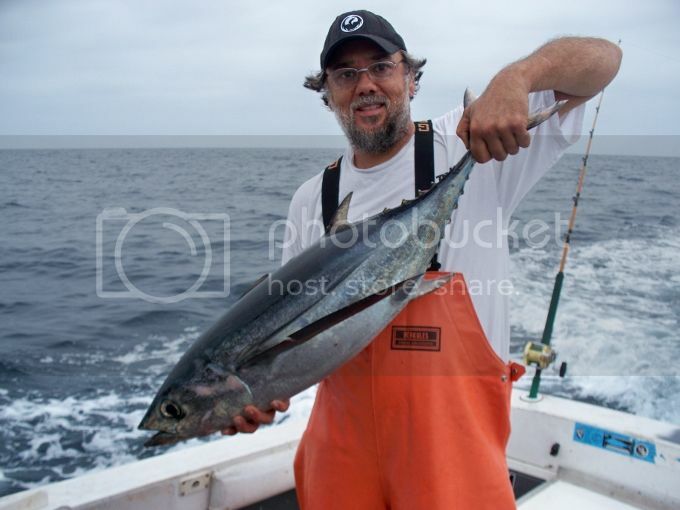 They have been catching lots of Albacore up north in Monterey and Half Moon Bay and further north. 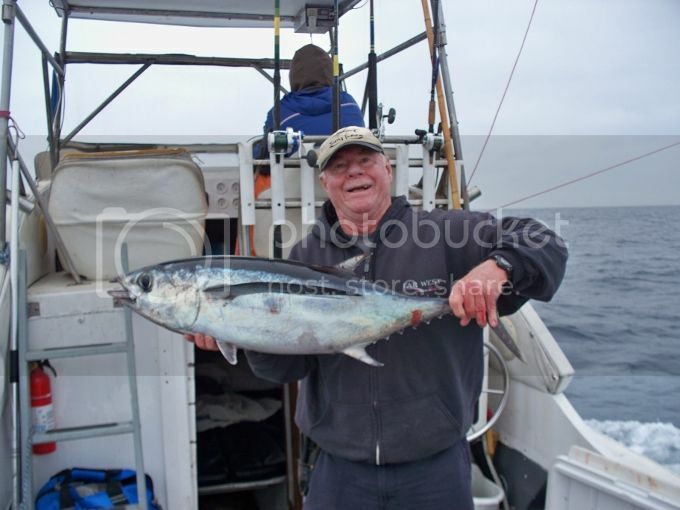 Some Albacore showed up in Morro Bay this week. We were trolling five rigs, the two outriggers and three others. The short bit lure was also a Zucchini Broomtail. Jeff was using a green and yellow regular feather on his second rig and a plain cedar plug on the third rig. My second rig contained a black and purple daisy chain cedar plug. About ten minutes later we had a double, both on the Zucchini rigs. Jeff also got bit on a diamond jig and promptly got bit off. He tossed out my Mega bait lure and got short bit. 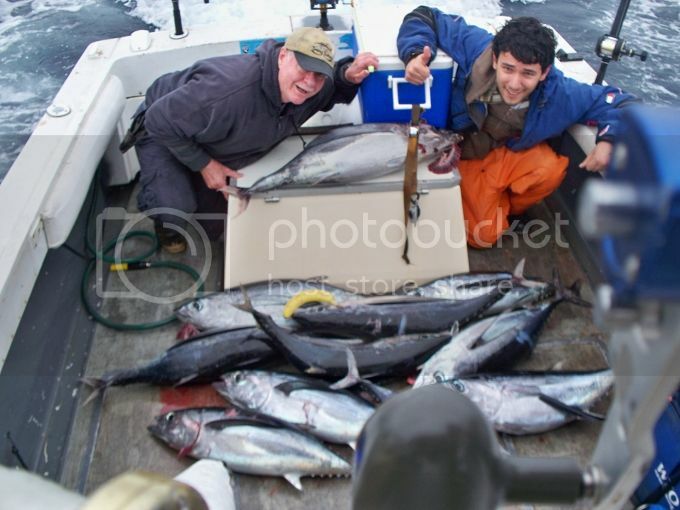 We landed both Albacore, cookie cutter 25 pound size. We had eight fish in the box and were feeling good about things. Another hookup resulted in a bust off, as the leader was frayed. We checked all the others and did re-ties on those that needed it. Getting bit stretched out to about 30 minutes between hook ups. We had another single and two doubles before deciding it was time to head home now 40 miles from the dock. We left three trollers out while we began filleting 13 Albacore. Seven miles later and nearly done with filleting the fish, Jeff spots jumpers in the distance. Birds were crashing on baits fleeing from their predators. We had a triple hook up and lost one. Put the trollers back in and several minutes passed with another double. We lost a single hook up, while I got bit on a Mega Bait. This was another brute, and took me for a nice ride. It wanted no part of the boat, especially after Sid stuck it in the tail area and it ripped free. Five times I got him to within gaff range only to see the Tuna turn its head and dive. Sid stuck him a second time in the same place and down he went. 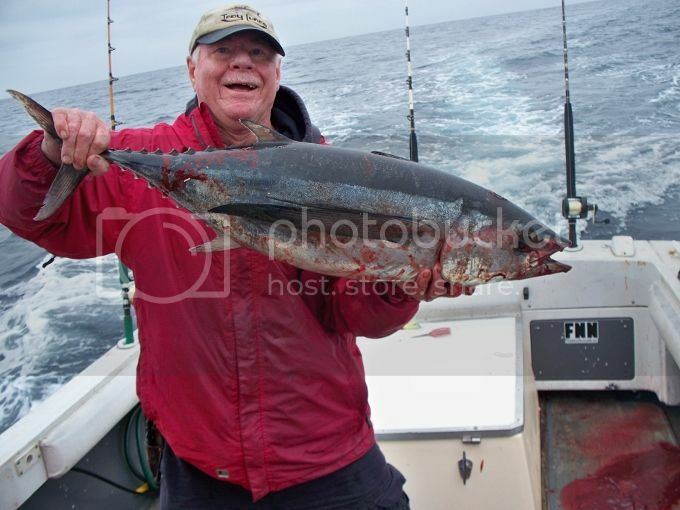 Jeff told Sid to use the bigger gaff and the tired 30+ pound Albacore was head shot. The Coronado Islands yield an occasional amount of Yellowtail for any given day. The Channel Islands yielded some White Seabass this week, as the Mirage returned from a 2 day trip Friday, 09-13-13 with 17 White Seabass, although most boats are fishing primarily for Rockfish. San Clemente Island has yielded some excellent counts on Yellowtail, as the Thunderbird caught 16 Yellowtail on Tuesday, 09-10-13. The Thunderbird ran a 1.5 day trip on Monday and got into a nice Bluefin Tuna bite, catching 51 Bluefin and 11 Yellowtail. Every now and then the Yellowtail are being caught at Catalina, as the Sport King managed to land a few Yellowtail on their recent trips to the island. Private boaters have done well recently out of Ensenada catching all four offshore species with some Yellowtail being caught at Todos Santos, and a couple of Barracuda. Locally the Sand Bass and Calico Bass is all but dormant, even on most Twilight trips! The local boats are doing well on catching Sculpin and Rockcod! Day time Bass fishing remains very slow, as does Twilight fishing for Sand Bass. The Thunderbird gets the job done on the Yellowtail on Tuesday, 09-11-13, catching 16. The weather forecast for Saturday and Sunday looks to be a bit breezy yet very fishable. Always check the latest forecast before leaving the dock. glad you guys nailed the Longfins!